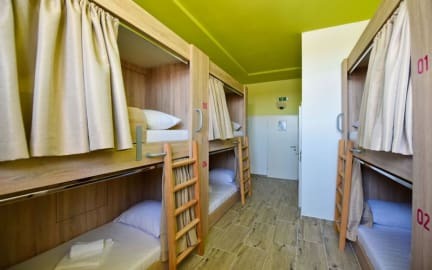 Hostel Zrće is a brand new hostel and a unique #partycation concept property where you can sleep, party, eat & repeat. Meet interesting new people and travelers from all over the world and enjoy the sights and sounds of Novalja town and the beats of our famous Zrce beach. Our common areas are the big open terrace with a sun deck & pool, bar, fitness and a restaurant. In our restaurant you can enjoy a variety of dishes as a large buffet style offering, all day long. Of course, we provide free - WiFi, linens, towels, lockers and key secured dorms. If you have any questions or need any help during or prior to your stay in our hostel, we have a phone and whatsapp number that is working 24/7. Hostel Zrće is perfectly located next to the central bus station, big hopping centre, hospital and a gas station. It is the closest accommodation to Zrće beach (only 10 minutes walk or few minutes drive) , and in close proximity of Novalja town centre (5 minute drive). Zrće beach is one of the most famous party beaches in the world, which many famous DJ's visit during the festivals. We are offering to our guests private rooms, dormitories and deluxe suits. Rooms are divided on 4, 6, 8 and 8+ people so that everyone can find a room that fits best to their needs. Our shared facilities are big, brand new and we take pride in our level of cleanliness. No kids are allowed on property, and our guests should be 16 years or older. Taxes not included - city tax 10.00 HRK per person per night. On check-in we take deposit of 300 HRK (40 €) per person which we return you at the end of your stay if there was no damage in the room. For arrivals from 01.05.2019. to 30.09.2019. 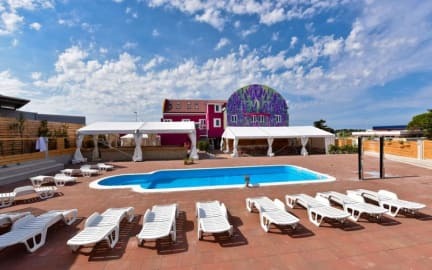 Ottima location, se potevo dare 10 e lode l'avrei fatto! Non ho trovato nessun tipo di problema, anzi sono rimasto stupito dall'alta qualità del servizio, complimenti! L’assenza di una cucina in un’isola così cara è una mancanza abbastanza grave. L’ostello offre un piccolo ristorante dove poter fare brunch e cena; i prezzi sono nella media ma la qualità dei prodotti è da fast food. Buoni invece i prezzi degli alcolici nel bar interno all’ostello. Piscina sempre aperta che permette di socializzare con gli altri membri nell’ostello.